"T" shirt quilts area great way to preserve memories of trips, sports activities, fraternity or sorority activities, and club membership. Take all of those "T" shirts and make them into a quilt for you or your children. They are perfect for graduation gifts that not only preserve those memories but also keep you warm on those cool evenings. They make great picnic blankets or stadium seating at your favorite outdoor sports activity as well. 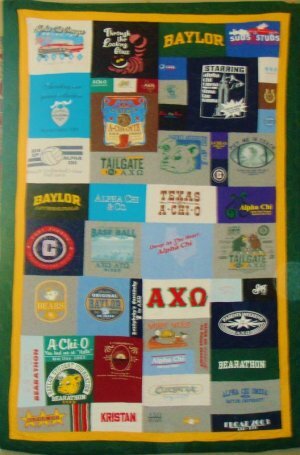 The quilt to the left (Baylor sorority quilt) is a highly custom collage style t-shirt quilt. 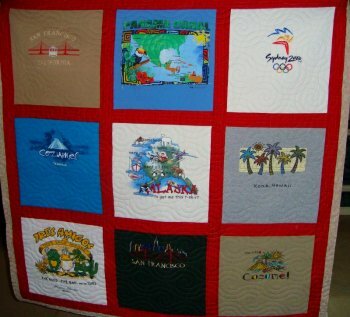 The quilt below used t-shirts from destination travel locations which were cut and joined with sashing in a uniform size. See pricing structure for details. Both were quilted with an overall swirl, circular design. One overall quilt design works best on a T-shirt/memory quilt because it unifies what is already a "busy" surface.